Posts categorized "Nick St. Christopher"
Yeah, that's right. I'm tired of all the Halloween themed blogs out there right now. Just deal with it! Powers: The full powers and abilities of the man known as Nick St. Christopher may yet to be revealed. He appears to have some psychic sense, enabling him to know when a person is sleeping or is awake, as well as knowing if a person has performed acts that can be classified as either "naughty" or "nice." St. Christopher has also exhibited space-altering powers, enabling him to transverse any place on the globe in the blink of an eye, to enter dwellings by way of small openings such as a chimney flue, and to produce gift-wrapped items as if out of nowhere. History: The full origin and history of the man known only as Nick St. Christopher remains unrevealed. He claims to have many stories regarding himself but will not claim any version as the definitive one. When the hero She-Hulk was working for a New York district attorney's office, she was asked to prosecute a man believed to have performed six murders, despite the fact that the evidence against him was entirely circumstantial. 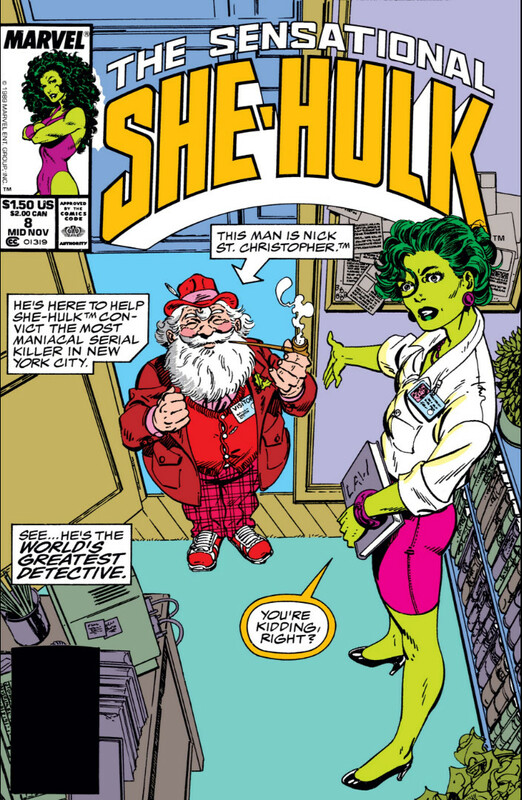 She-Hulk was approached by Nick St. Christopher, who claimed to be the world's greatest detective. Although skeptical, She-Hulk agreed and, with St. Christopher's seemingly magic powers, was finally able to find concrete evidence to ensure the defendant's conviction. Nick St. Christopher had forced numerous, if unrequited, amorous advances on She-Hulk during their adventure, but after the arraignment, was ultimately stopped by the sudden appearance of his wife, who forced her henpecked husband to leave.